It’s the Chinese New Year on the 8th, so many online stores sourced from China and Singapore, or with Chinese owners are taking a break. During this time of year, many offer deep discounts and special sales because it could be the end of March to the middle of April before you get your items. As I was browsing around looking for and revisiting some links, I found some awesome deals. CE4 Clearomizer/Atomizer with LED light E5Cig.com, multicolor 8 pack for $6.07 – If you like your vaping fun, or miss the light indicator then these are good for you. 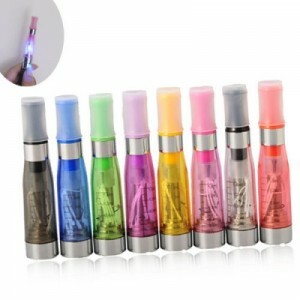 Just be aware that when you order this kind of clearomizer, they may come with the LED at any place along the core shaft. Different factories make them differently, so don’t be upset if it’s not exactly like the photo. It will have a light in it. E5Cigs.com does not offer free shipping, but even with the shipping, you’ll save, unless you’re ordering a heavy package. If you are, then it just so happens that FastTech is also having a sale on these, a pack of 7 for $8.64, and they offer discounts for buying 3 or more packs, and have free shipping. Both are 2.4 Ohm, so they should work reasonably well with your normal 650-900mAh eGo type batteries, and wonderfully in a 1100mAh or higher battery with variable voltage. I have some of these, and I love them. If you are the type who likes to wear bright colors and don’t mind getting a bit of attention, then these are for you. They show off the sheen of a metallic battery or other accessories. They go well with the trending rainbow batteries or chameleon/oil slick wraps. If you live in a place with a lot of smokers, being noticed helps spread the joy of switching. 2.4ohm, atomizer, beginner, ce4, ce4 $1, ce4 dollar or less, ce4 led, ce4 lowest prices, ce4 one dollar, ce4w, clearomizer, e cigarette, ecigs lowest prices, electronic cigarette, led clearomizer, paypal, retail, sale, supplies, vape, vaping. Bookmark.